Today, it would be difficult to contemplate life without electricity. A world without lights, plugs, computers, televisions and telephones might sound appealing to some, but would be unimaginable to most. Rewind about one hundred years and companies were trying to persuade the public to adopt this new resource. 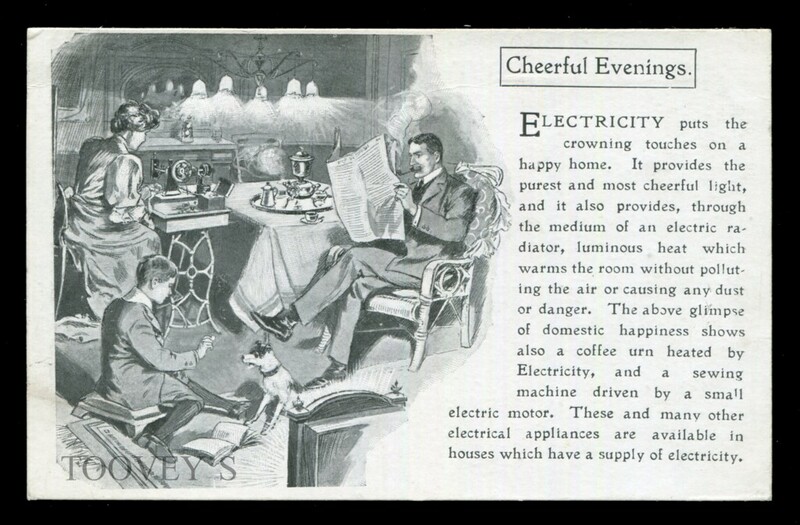 The advertising postcard above offered earlier in the year by Toovey’s tries to sell the idea of cheerful evenings at home with electricity. Councils were also being targeted to illuminate the city streets with electric street lamps, a slightly harder sell as many had only recently invested in gas lamps to guide the public through the smoggy streets. Needless to say they were convinced by the electrical illuminant and never looked back. The gas-lamps produced a lot of wasted heat. In 1895, a solicitor, Mr H.M. Robinson, conceived the plan of making hot water (a scarce commodity among the working classes) at a price the public could afford by utilizing the lamp’s by-product of heat. After a successful patent application the Hot Water Supply Syndicate was created, later changing its name to The Pluto Hot Water Supply Syndicate. At the Great Exhibition of 1897, a demonstration was made of a gas lamp that also included an automatic machine which could dispense a gallon of hot water, or a halfpennies worth of Beef tea essence, Cocoa, Milk, Sugar, Tea or Coffee. The demonstration model worked flawlessly, with as many as 125 halfpennies being taken in one day. In 1898, on the south-east corner of Leicester Square one such gas-lamp was introduced, having been installed in Liverpool and Southwark prior. Each lamp had a thermometer to prove the water’s temperature and a communal enamelled cup chained to the post. The gas lamp’s success was stymied by electricity, so the interest from other London Districts, Manchester and Glasgow never progressed. While electricity has advanced so many technologies and industries it seems it actually temporarily thwarted the progression of affordable vending machines! 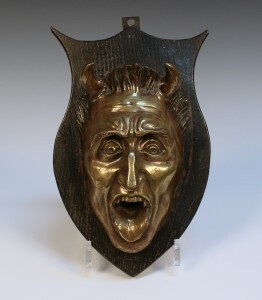 Included in Toovey’s forthcoming auction of Collectors’ Items on the 4th December 2015 is a late 19th Century gilt patinated cast bronze mask in the form of a horned man with open mouth and stuck-out tongue, probably ‘Pluto’ – the dispensing mount of a Victorian gaslight vending machine. Offered as Lot 2640 this Victorian curiosity carries a pre-sale estimate of £100-200.